You can set your clocks by Swiss trains, along with its postal busses, lake steamers, and city bus lines. All are connected in a dense travel system that is synchronized for amazingly easy and prompt connections that is an unforgettable experience. Although Switzerland’s unique paradise is only 216 miles from north to south and 137 miles from east to west, it encompasses four diverse cultural regions where the people speak different languages: German – 64%, French – 23%, Italian – 8%, and Romansch – 1%. After landing at Zurich’s airport, it's an easy walk to the airport’s own train station. From here the route travels through eastern Switzerland to the Europe’s largest Rhine Falls and the city of Schaffhausen, with its landmark Munot fortress. You pass Lake Constance which shares its shoreline with Germany and Austria, and in about an hour arrive in the university city of St. Gallen, founded in the seventh century. A popular attraction is the Abbey Library, which houses some 170,000 rare books and manuscripts. The best way to discover all the delights of Switzerland is by taking its “Grand Train Tour” — eight inter-linked rail routes which bring together the highlights of Swiss public transport, placing the emphasis on must-see attractions. This wonderfully diverse journey will whisk you through spectacular scenery as you lean back, rest, and relax in comfort. One of the most popular train routes is the famous Glacier Express which links the Alpine resorts of St. Moritz and Zermatt that is surrounded by snow-capped mountains and the majestic Matterhorn. The train crosses no fewer than 291 bridges, passes through 91 tunnels and travels along seven valleys. The journey from Canton Valais to the Engadine takes about eight hours, winding past glistening glaciers and crystal clear lakes. The Glacier Express travels through the glorious Goms region with its typical timbered dwellings. The sunny valley of the Upper Goms is one of the most beautiful landscapes in Switzerland. It then continues through the rugged splendor of the Rhine Gorge (the “Grand Canyon of Switzerland”). From Chur, the route extends to the famous holiday resort of St. Moritz which became the birthplace of Alpine tourism in 1864. 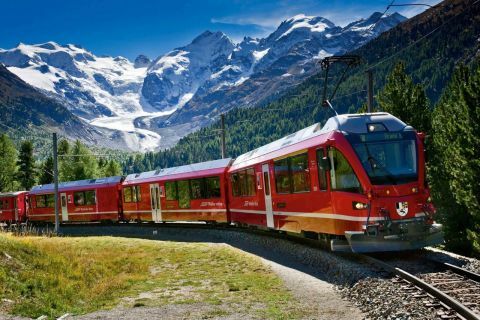 The “Grand Train Tour of Switzerland” also includes three other panorama trains — the Bernina Express, the Golden Pass, and the William Tell Express. The Bernina Express is one of the most unforgettable routes in Switzerland, offering breathtaking views of the Morteratsch Glacier, Lake Bianco, and the Poschiavo Valley in Italian-speaking Switzerland. The Bernina Express Bus, the Palm Express, runs year-round past a cluster of quaint villages and Lake Como enroute to the palm trees that line Lugano's lakefront. The Golden Pass Line links German-speaking central Switzerland with the French language part of the country. This route passes countless lakes and waterfalls, including world-renowned destinations such as Lucerne, Interlaken, Gstaad, and Montreux on Lake Geneva. And then there is the William Tell Express, which takes travelers to sun-kissed Canton Ticino with its Mediterranean-like magic. The first part of the journey is by boat across Lake Lucerne, followed by the first class train trip in panoramic railcars along the wonderful historic Gotthard route, an outstanding engineering achievement that was opened in 1882. The Swiss have also created a perfect system for baggage transportation. Visitors from abroad can hand in baggage at any departure airport worldwide and have it delivered directly to their Swiss destination. With selected airlines, the system operates in the opposite direction when travelling back from Switzerland. And while traveling within Switzerland, visitors can also have their baggage forwarded from one destination to another. To find out more on this, visit www.SwissTravelSystem.com/baggage.